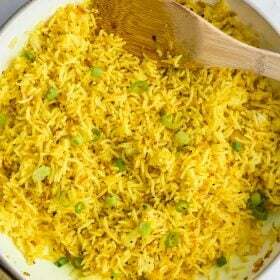 Turmeric Lemon Rice- this easy side dish is healthy and easy to throw together. It’s surprisingly refreshing and the perfect pairing for any dinner! If you haven’t already done so, cook your rice. I LOVE the ease of cooking basmati rice in my instant pot. That recipe is HERE. In a large skillet, heat the oil over medium heat. Once hot, add in the onion and saute for 5 minutes until it becomes soft and translucent. Add in the garlic and saute for an additional 3 minutes. To the skillet add the cooked rice, lemon zest and juice, turmeric, salt and pepper. Stir to combine and continue to cook until everything is warmer through.